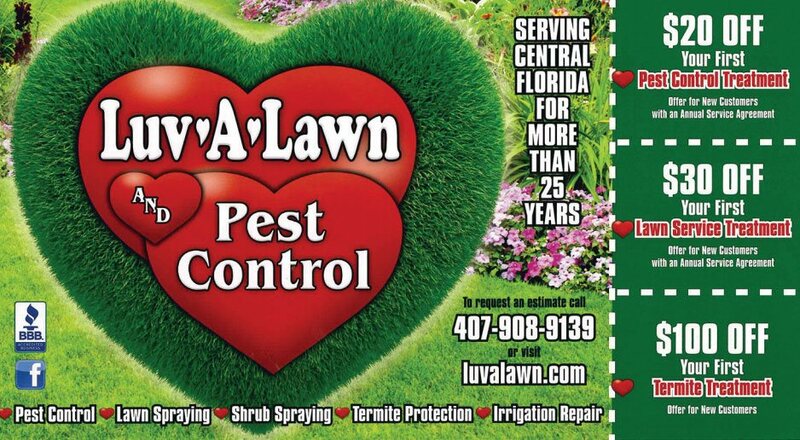 Luv-A-Lawn and Pest Control, Inc (formally Valentine’s Lawn & Shrub Care) was established in 2009 in Osceola County. The owner of Luv A Lawn and Pest Control and our team have extensive experience with Central Florida Landscapes. Over 30 years of combined experience right here in Osceola County. Luv-A-Lawn and Pest Control came about as a result of the demand for a “High Quality” local privately owned and operated Lawn, Shrub, and Pest Control company. A company where “Personal Customer Service” is job # 1. We live it, we love it. From time to time we will provide special offers here. Click the coupon below to print and claim.